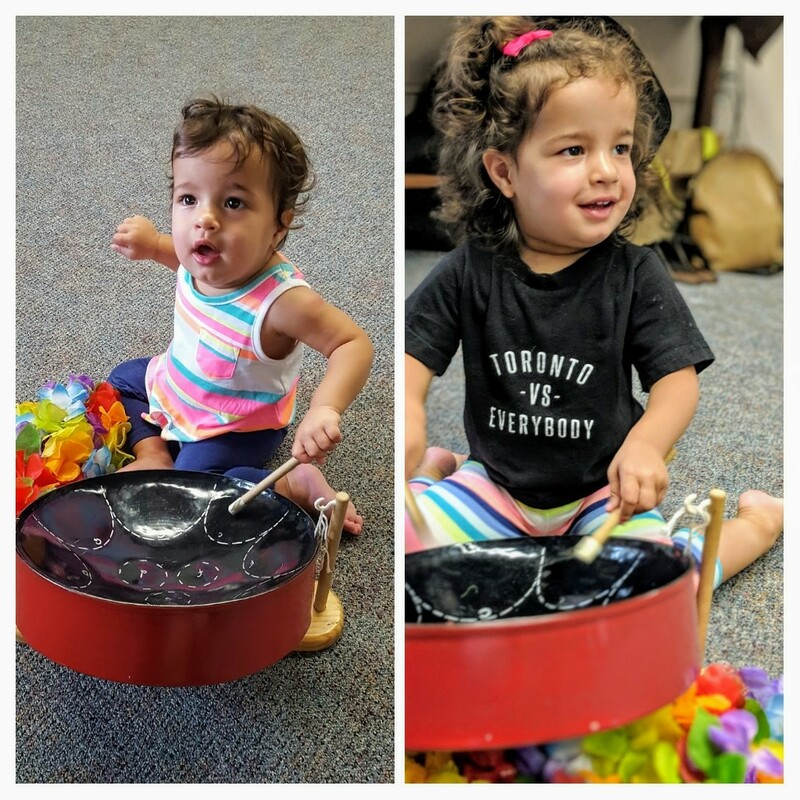 Best baby and toddler Toronto music classes! 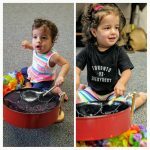 10 reasons why Rainbow Songs has the best baby and toddler Toronto music classes! Thanks for making Rainbow Songs the favourite Toronto music school for babies and toddlers. Your feedback from classes lets us know that our classes are so fun, engaging and enriching. Come sing with us today! We look forward to making music together with you and your little one. Check out what families have to say about our music classes. Here’s the top 10 reasons why Rainbow Songs music school is the place to go for preschool enrichment music education! Our music teachers are the best! 1. Teachers are excellent musicians, know tons of baby and toddler songs, and are wonderful with kids and adults alike! Our teachers come to Rainbow Songs with a love of and enthusiasm for working with children and young families, the ability to sing and play guitar and and a desire to learn. Our music teachers train for months before they become certified instructors with their own classes. Even after our teachers have their own classes the learning continues. They are continually learning new approaches to teaching and also expand their song list. Further learning continues with workshops and professional development. 2. We mix musical fun with learning! Our motto is Make Music, Make Friends, Have Fun! 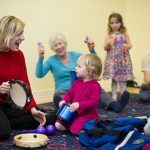 Yes, our baby and toddler music classes will help your child learn, but we want you and your infant or toddler to have a great time. Our families let us know that they love our teachers, the songs and activities and meeting other families. They tell us that they have a fantastic time and that their children say that our baby and toddler music classes are the highlight of their week. 3. Specific music classes for different stages of development and mixed age classes too! Try our mixed aged classes, PLUS also our baby, 1-2 year old and 2-4 year old classes. Rainbow Songs classes are geared towards your child’s developmental stages. 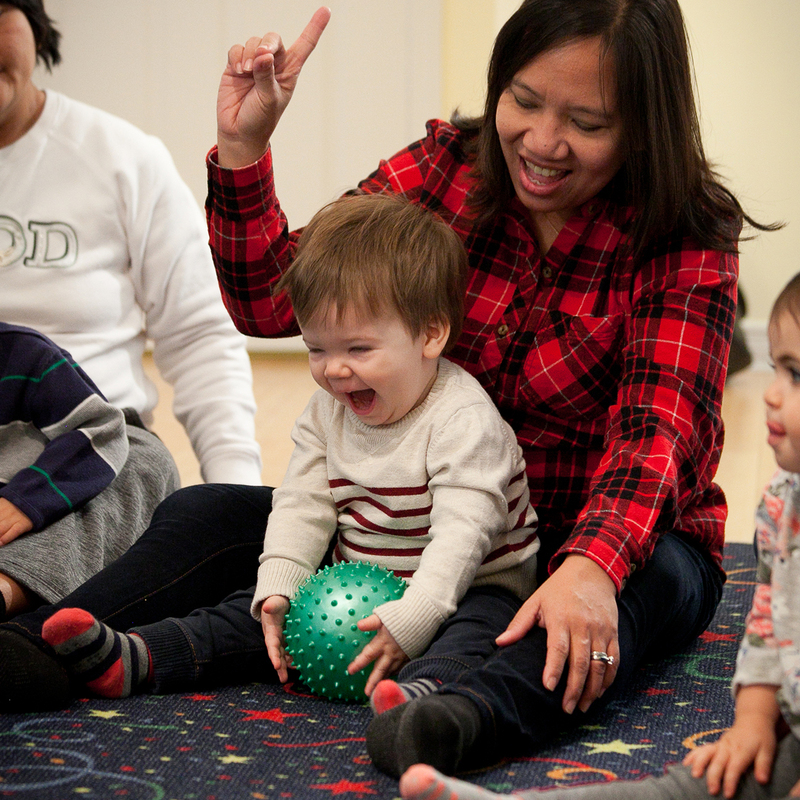 The baby and toddler activities in our programs support your child’s growth. We have specialized baby classes, music classes for one year olds and toddler music classes for 2-4 year olds. As well, we know that families love to sing together and so we also offer some mixed age classes. 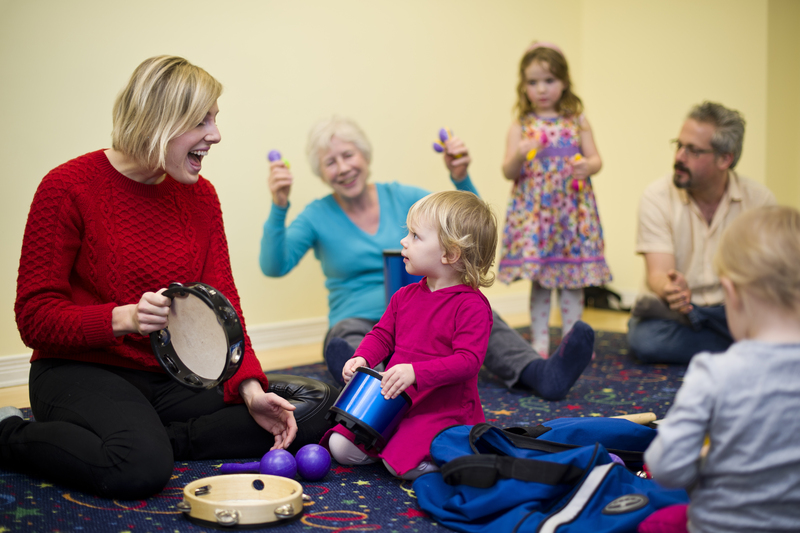 Our knowledgeable teachers know the repertoire and are flexible in being able to who you how you can sing a song and do fun activities with both your baby and toddler! We always support families singing together. If you want to participate in our 2-4 year old program with your toddler we encourage you to bring your baby too! Families who have more than one child enrolled in the same class get a 25% discount on the second and successive registrations. We know that children (and parents!) need a mix of repetition as well as diversity. Our curriculum is structured so that some songs are repeated regularly (for example, Hello and Good Bye songs) in order to support learning. Other songs are sung a few weeks in a row based upon the theme of the week, developmental skills being worked on. Interactive and participatory activities are woven into the flow of each class to provide a musical journey that is fun for all! 5. Explore new instruments from around the world. In our music classes we value sharing a love of musical instruments from different countries. In our music programs we highlight and teach about the these different instruments. As well, we give you and your child a chance to play and learn together. Try out instruments like the African djembe, the Tibetan tingsha, the Caribbean steel pan and many more fun instruments! Learn new songs that are featured in our theme weeks. Teachers will take the time a couple weeks ahead of the special theme week to start introducing songs for these special occasions. What will you put in your brew at Halloween? Have a favourite animal song? We’ll sing about animals during Animal Week. And don’t forget to come dressed up for both Halloween and Animal Week. Don’t have a costume? All good. We’ll have extra costumes for you and your little one! Other fun theme weeks include Earth Week and Caribana Week. 7. Extra Resources – make music together at home with our 7 Award Winning CDs. Families love the songs we sing in class. Want to listen to the baby and toddler songs that you sing in your music class? Forget the lyrics to a tune? Your child has a favourite song and wants to sing along? Making music together at home with your toddler or infant is a fun activity for the whole family! Choose from one of the 7 Rainbow Songs awards winning CDs and have a great time singing with your little one! Each CD comes with a colourful booklet with fun images. As well, the lyrics to each song are there too. Remember, if you enroll in one of our baby or toddler music classes within the first three weeks of the session you a free CD! Songs about numbers? We’ve got them. Want some baby and toddlers songs to help learn the letters of the alphabet? Check. Want to sing about colours? Yep. The songs we sing in our baby and toddler classes are tons of fun AND they are wonderful foundation for the building blocks of early literacy. 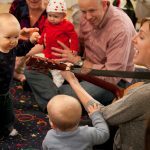 Your baby and child will learn how to take turn, share, and be part of a musical community while singing together, using props such as balls, beanbags, and special instruments from around the world. 9. Easy enrollment, no hidden fees, 20 locations and great flexibility! Over 20 000 Toronto families have sung with RS since it started. With 20 locations in the GTA we are sure to find a class in your neighbourhood for you and your little one. Convenient and easy enrollment. There are no initiation fees! We also offer prorated enrollment, sibling discounts and drop-in classes. Our make-up classes can be taken at any of our locations throughout Toronto. 10. Learn percussion, melody, rhythm, beat and other musical musical concepts in a fun and engaging environment. The Rainbow Songs early childhood music curriculum consists of interactive baby and toddler songs and musical activities that use actions, repetition, instruments and sign language to stimulate your child and support learning. As your infant and preschooler grows, our curriculum will continue to facilitate their development. For example, your young child will learn to keep a steady beat as they clap their hands. As well, they will practice rhythm while having fun using percussion instruments during the Rainbow Songs band jam session.